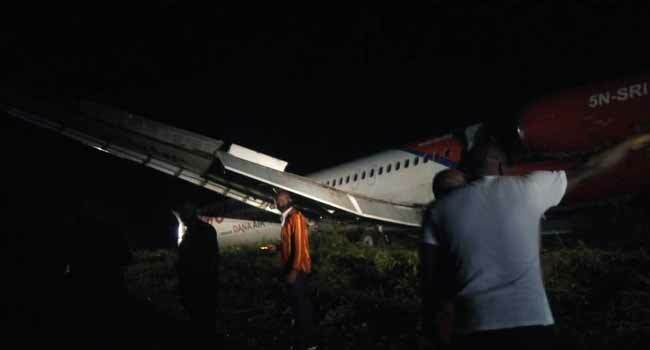 The passengers of the near crash landing of Dana Plane at Port Harcourt International Airport are lamenting over what they describe as utter neglect being experienced since the incident occurred. According to them, no one has come forward to explain what transpired yesterday evening or inform them about how to access their luggage. One of the passengers also informed our correspondent that contrary to reports, the plane landed normally, but could not explain what happened thereafter. Meanwhile, Dana Air has refuted claims that they (passengers) have been treated with neglect. In a statement by the Media Communications Manager, Dana Air, Kingsley Esenwa, “We cannot neglect and will never neglect our guests. “We have been in touch with them since the incident and have also assured them of our willingness to assist where necessary. We have also provided logistics to ensure that all checked-in items are delivered to them as soon as possible”. However, it is business as usual as passengers were seen trying to purchase their tickets to their various destinations from the same airline. Unconfirmed reports have it that some officials of FAAN and Dana Airline are currently at the spot where the Plane ended up, which they say has been cordoned off. On Tuesday, a plane belonging to Dana Air overshot the runway in Port Harcourt on Tuesday after landing at the Port Harcourt Airport. The General Manager, Corporate Affairs, Federal Airports Authority of Nigeria, Henrietta Yakubu, confirmed the incident. She said, “A Dana aircraft numbered 9J0363, flying from Abuja to Port Harcourt airport has overshot the Port Harcourt runway. “The incident was suspected to have been caused by a heavy rain, which was accompanied by strong wind and storm in Port Harcourt. The Communications Manager for the airline, Mr Kingsley Ezenwa, said in a statement the plane “skidded off the runway at the Port Harcourt International Airport, as a result of the bad weather situation and torrential rain at the time of landing”. The airline commended the pilot for how he handled the issue, adding that all passengers and crew disembarked safely.